The essence of my blog and what got me interested in blogging, has been based on my Disney Meal Plans. With meal planning, it can be easy to fall too far into a routine. Meals become tired, boring, and not as appealing as they once were when added to our recipe rotation. Long before I implemented flairs of Disney into my weekly meal plans, I was a meal plan junky. I loved how planning out particular meals would make grocery shopping easier since I had a plan, rather than aimlessly wandering the aisles. Not only that, but having a plan and getting exactly what I needed helped me stay within budget and not overspend. The disadvantages of a typical meal plan? Often times, once a certain day rolled around, I may not have the energy to cook what I planned, or I might be in the mood for something different. Or sometimes stopping to get fast food just seemed more fun, and more of a treat than just eating at home. The other major disadvantage? I would tend to run out of ideas and cook the same few meals…to put it simply, my regular meal plan was BORING! I needed some inspiration. All of that changed one day when I thought—why not make ALL of my meal plans Disney themed? Every other aspect of my life relates to Disney, why not the food I eat? What is a “Disney Meal Plan”? Me and my daughter trying on my Minnie ear collection after checking out my weekly meal plan haul. I pick a theme for each day that relates to Disney and work from there. For example, I might do a day of food inspired by the Norway Pavilion at the Epcot World Showcase, or have a Zootopia day. Once I pick the theme I want each day of the week to have, I then brainstorm what recipes would fit in with my themes, as well as be a clean eating recipe. I strongly believe that clean eating helps not only with physical well-being, but spiritual and mental well-being too. I make sure all of my recipes are clean-eating since that’s a must in my household. This coming week I am making zoodles (zucchini noodles) as part of a Zootopia day, and making a clean eating and healthy version of Epcot’s Norway Pavilion School Bread for breakfast! 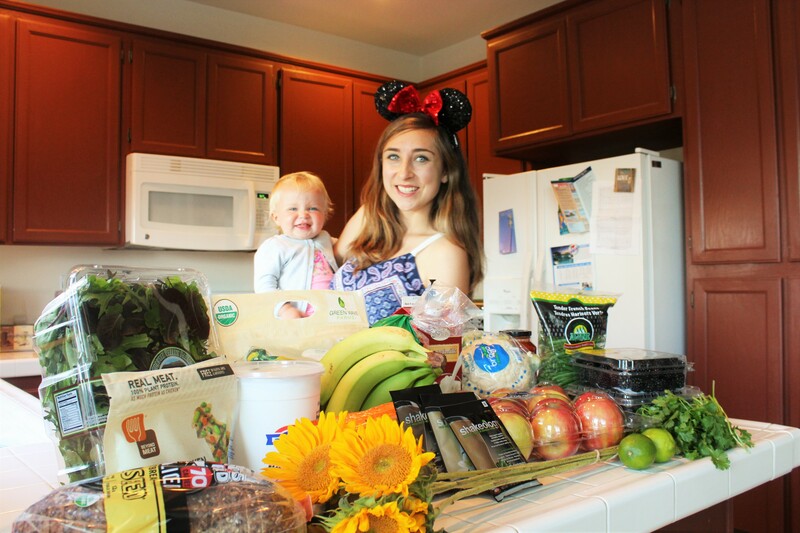 Why a Disney Meal Plan? To come up with an inspiring meal plan you’re excited to stick to, you can theme it around anything you’re passionate about. Passionate about travel? Do a different country or city food theme each day…you get the picture. I am always daydreaming about my next Disney trip, watching Disney movies with my family, and do frequent trips to Disneyland. When I’m not doing those things, I’m day-dreaming about them. Since Disney is my escape, I thought if I were to theme my recipes in a Disney way, it will give me that feeling of wonder all day long. And boy, it does! When I recently had my Zootopia-themed meal plan, the movie was at the forefront of my mind, and helped inspire my activities for the day. My toddler ended up dancing to “Try Everything” throughout the afternoon, since thinking of the movie made me want to play that song. We had a dance party in our living room! She and I now have this wonderful memory, in what would have otherwise been a mundane afternoon. Later on, we played Judy and Nick with her Zootopia ZPD walkie talkies. It really helps inspire activities to do with your family that make those gaps of time between vacations and day trips magical and memorable. Like with most meal plans, you are saving money. By making a careful plan for your week, you are only buying the exact amount of food you need! No more lost pantry items, or half thrown out produce. However, a Disney meal plan, at least in my case, has saved me even more money than my non-themed plans. The reason? Because with my old, boring recipe rotations I would often get sick of making the same meals. When it came time to make them they didn’t sound appetizing, so the food I bought went to waste and I ate out instead. Double hit on the finances. Even though I’m cooking meals like zoodles, or eating Greek yogurt and berries, my toddler still eats it! Saying my meals are themed to various Disney movies make healthy foods more appealing to a children (Can you imagine the excitement in telling your child that all their meals that day have to do with Frozen?). How do you make a Disney meal plan? Well, you can either do the steps I suggested in the beginning of the article, which is start by picking your daily theme for each day of the week, then brainstorming meals to fit your lifestyle. If you want some already awesome ideas I’ve made, the menus are available under the “Weekly Menus” section of my site, with some specific recipes under “recipes”. I love sharing my food and clean eating Disney style, so I also run a fitness/nutrition accountability group on Facebook you can join for a new complete menu with recipes each week in conjunction with a 21 Day Fix program. Happy planning! And I would love to hear from you on which Disney themed day you would like to see me try next. I am loving this theme based meal planning idea. Great post!